where all of the magic happens: The Barrel Room. One key attribute which differentiates us from other local breweries is our dedication to fermentation in Oak barrels and Foeders. yeasts and bacteria. This long process produces dry, tart, mature beers, which are later blended to produce our final products. 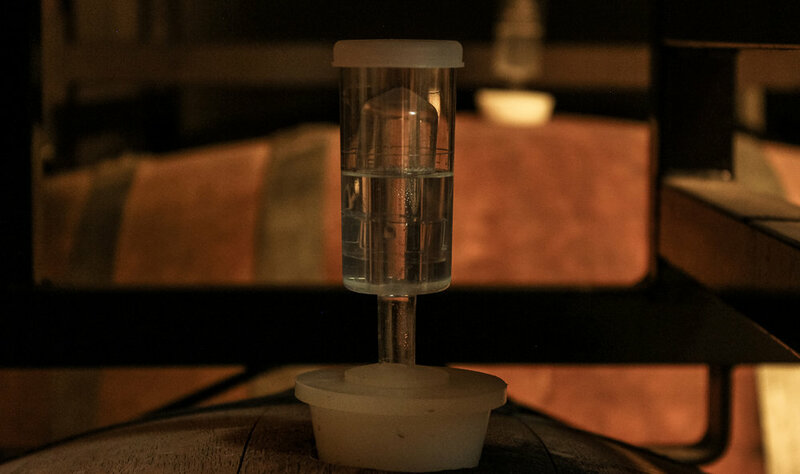 Each oak cask in our barrel farm contains a unique micro-biological universe, which dramatically shapes the final qualities of the beer. Every barrel has a unique name, history, and pedigree. Each barrel creates different flavors and character. Used barrels are sourced from small, bio-dynamic, California wineries as well as from premium US distilleries. into wine barrels which can last lifetimes. the used barrels come to Dry River to live a new life making delicious sour beer. Barrel names reflect the globe/culture trotting experiences of Brewmaster Naga Reshi. The Yoruba word for the goddess of the sea, a legend kept alive in the fishing villages of Bahia, Brazil. This mermaid goddess was prevalent in the is the island of Itaparica where Naga loved to kayak and built his first brewery called Karamuru. This barrel came to us from Sanguis Winery in Santa Barbara, and produces excellent, clean sours with a citrus character. used as a base in our Cuvée blends.